Leo, 14, and Mint Chocolate Chip. Old Wolf. I chose to read it because I love books about animals, adventure, and the wilderness. I also love wolves. My favorite part was when the protagonist who was the wolf character first came in contact with the other lead character, Casey, a young kid, who became his companion for a while. The wolf was wounded and the kid saved his life. They bonded of course. 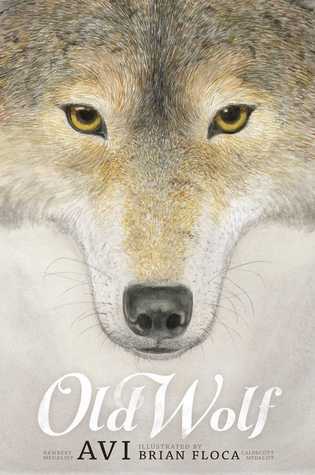 It is not an unusual story but the writing was great and both he-wolf and he boy tell their sides. At some point, a crow tries to give the wolf who is starving in winter some pointers on survival. The wolf doesn't listen. I would have. It's the type of book that keeps you hooked from the start and I hardly ever get hooked. It was one of the main reasons I picked it up to read. It drew me in. No, I wouldn't because I loved the story so much I want to leave it where it ended. From Avi’s author page, about where his ideas come from. One gets ideas by thinking about books, and how they are constructed. That is, ideas do not come to me whole, they are created slowly by looking at things and people and situations in terms of stories. Everybody has ideas. The vital question is, what do you do with them? My wife, a college teacher, users her ideas to understand literature. My rock musician sons shape their ideas into music. My sister takes her ideas and fashions them into poems. My brother uses his ideas to help him understand science. I take my ideas and turn them into stories. Now, what do you think you'll do with your ideas? Thank you, Leo, for sharing your favorite book with us! In the computer game world of Bow Hunter (Casey's world) there are no deaths, just kills. In the wolf world (Nashoba's world) there have been no kills. For this is March, the Starving Time in the Iron Mountain region of Colorado when wolves and ravens alike are desperate for food. With the help of a raven, the miraculous Merla, Nashoba must lead his pack of eight to a next meal. The wolf hates being dependent on a mere bird, but Merla is a bird wise beyond her years. And when thirteen-year-old Casey crosses their path, two very different approaches to hunting collide.